With the upcoming holiday season, I wanted to make some type of "Christmas" cupcake to share at work. I planned to bring them in for a combined "celebration" - my wonderful interns had completed their month on the unit, and one of our patients completed her transplant and was ready to go home after a long 7 week stay with us! Preheat oven to 350° F. Line a 12-cup muffin tin with paper liners. In a small bowl, mix together the rum extract, eggnog, vegetable oil, and vanilla extract. In a large bowl, mix together the nutmeg, sugar, flour, baking soda, baking powder and salt. Pour the liquid ingredients into the dry ingredients and whisk until just combined. Divide evenly between prepared muffin wells. Bake for 18-20 minutes, or until a toothpick inserted in the center comes out clean and the cakes spring back when lightly pressed. Cool in the pan 5 minutes, then transfer to a wire rack to cool completely. Whip up whipping cream in mixer until soft peaks begin to form. Fold in mascarpone. While mixing over low speed, slowly add the coffee granules and confectioner's sugar, one cup at a time, being careful not to over whip frosting. Those lines soooo look like the daily med cups from a hospital! REALLY SUPER CUTE. The presentation is fabulous & I adore the coffee frosting. The recipients are going to love these. Happy Holidays! I love that you served it in a little cup. So cute! And the flavor sounds so good! This is perfect for our family reunion. I am sure that they will be amazed with this one. what a great photo and blog...new follower! 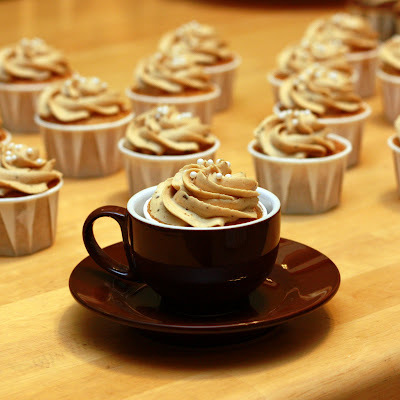 love the eggnog cuppies!